* Caution- discuss with the students the harmful potential if the solution is digested. Take your class outside, making sure to bring all of the items listed above. It should be a nice day outside when you are ready to do this project. It can be windy, but should not be cloudy. Split the children into groups. You will need one bowl and one container of bubbles for each group. It is much easier to manage than getting enough bowls and bubbles for the each student in the class. Give each group a bowl full of bubbles. Hand each group a set of eight to ten pipe cleaners. Ask the students if they have ever seen a bubble in any shape other than a sphere. 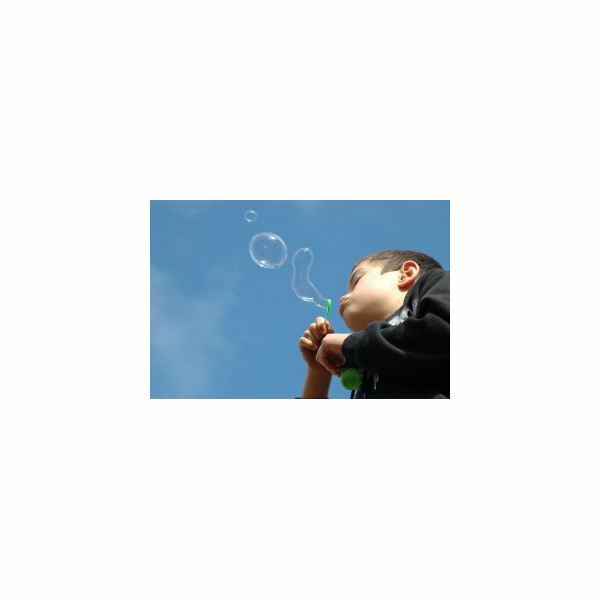 Then ask the children if they believe bubbles can be blown into any other shape. Have them record their predictions into the notebooks. If they can’t spell yet, show them how to write the words "My Guess" at the top of the page. When they are older they will come to know this as their hypothesis. Mention and define the term, hypothesis. Have the students repeat the formal name after you. Let the children know that they are going to have a chance to test their hypothesis, or guess, by performing an experiment. Have the children in each group create several shapes with the pipe cleaner. They just need to leave one end so that they can hold onto it like a regular bubble wand. Now have the students dip the pipe cleaners into the bowl of bubbles and blow. Ask the children if the shapes came out as they expected. Have the children write what really happened in their notebooks. Let them draw a picture of the shape they made with the wand and draw the shape of the bubble it made next to it. Now have the children investigate the colors of the bubbles. This is fun. Some of the children blow the bubbles and some try to catch the bubbles. Have the children write down any colors that they see in the bubble or in the bubble reflections. Take time to review with the children what they learned. Give them a chance to share if anything that they learned was a surprise to them.